All smiles on a Native Garden Demonstration walk in Wachapreague! The resident scientists, Brandon and Kyle, discussing science! Frying up eggplant from the No Limits community garden. It was the bomb! Thanks David and Maryann. Amy and Kyle working hard on writing resource reviews for the No Limits website. Good work y’all! Two men hard at work. Thanks for fixing the sink Adrian and David! Another bright and sunny day for the No Limits Hot Dog Cart – hooray! Even trash cans need cleaning! Good job Brandon. All moved into their new homes. These are hardy Windmill Palm Trees that were cultivated from seed in the No Limits garden! Having some fun on Adrian’s birthday. He really enjoyed Maryann and Zel’s gift, haha! Happy birthday Adrian! It was a fun one, and the brownies were mmm mm good! She’s here, she’s here! Our friend Charlene came in to speak about her wonderful missionary work in Africa. Charlene provides missionary work in the Democratic Republic of Congo in Africa. It is always very interesting to listen to her speak! Charlene’s mother, who is also a dear friend of No Limits, Margaret Ann came as well. It was so wonderful to see y’all! Margaret Ann and Charlene enjoying a nice chat in the No Limits garden. Brandon wanted to show Charlene our banana tree after learning that she lives near MILLIONS of banana trees in Africa. Can you see the tree through the left window of the crabshack building? 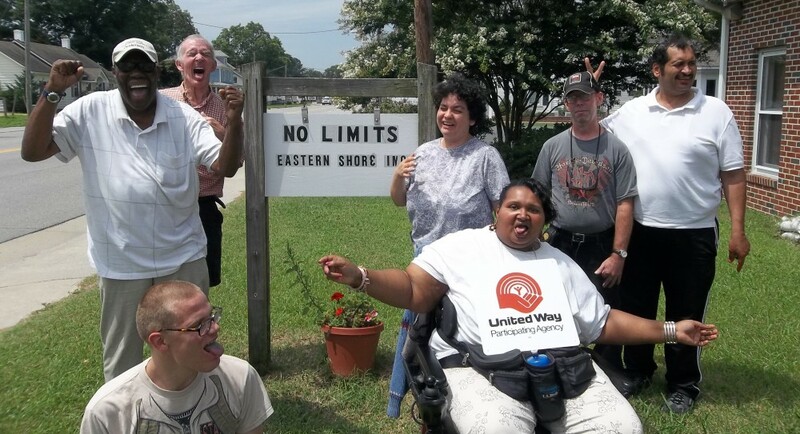 A nice shot of No Limits Eastern Shore (and the No Limits Hot Dog Cart) on a beautiful day. We took a trip to Thomas Gardens to pick out native species plants for our community garden. Go Brandon go! End of the season for our cukes. Thanks for feeding us! Brandon harvested seeds from an unripe watermelon. Hiding Geocaches! Check out No Limits’ Geocaches by going to Geocaching.com and searching for the caches titled “Native Plants of the Eastern Shore #1 & #2”. The Official No Limits Geocaching Team. Great work! Rachel and Brandon power washing the chicken coop. The beginnings of our hanging native plants garden! Black-Eyed Susans are native to Virginia and are a beautiful flower. Watering the watermelon patch. Cool shot! CL setting up the No Limits Hot Dog Cart. Thank you to the community for all of your continued support. The cart SOLD OUT today for the 3rd time this summer!!! Awesome! Our beautiful yard on a beautiful day. Thanks Adrian and Zel for keeping the lawn looking fresh! Happy birthday Sherry, and many many more! The lemon bars were so yummy! Three men hard at work. Good job! DJ helping out with chores before the weekend. Thanks a bunch DJ! Weed wacker repair! Good job men. Work on David, work on! Workin’ on Comfort Dolls is fun and productive work. Amy posing with her cake before it gets eaten. Yum yum yum! Happy birthday Amy, and many many more! You may also call (757) 789-3990 or e-mail nolimitseasternshore@gmail.com to request a paper form. Completed paper surveys may be mailed, faxed, or e-mailed to No Limits Eastern Shore.